A non-wetsuit sea swim in March? Clearly Stuart Lumb - better known as Jet Set Super Vet - has been on his travels again. This time, it wasn't off-road and he wasn't 'lanterne rouge' either - and Thailand was the destination. You can read more about Stuart in his Tri247 column HERE. Stuart Lumb, aka Jet Set Super Vet, is still living up to his nickname. Every two years I attend a big livestock trade fair in Bangkok where I meet up with my good friend Chakrit Ridmontri, who is a fellow journalist. 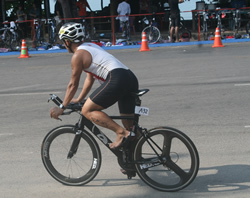 A while back Chakrit happened to mention that his brother Jirasit, whose nickname is Tle but which is pronounced “Thun” was a keen triathlete and that the Sunday after the trade fair the Thai Triathlon Federation was putting on a Standard distance / Sprint event at Rayang, a small coastal resort two hours drive south of Bangkok city. I didn't want to ship my bike out so Thun very kindly got one of his mates to lend me his Bianchi Nirone – obviously a very trusting guy who I sadly never got to meet. I also took my own pedals (but ended up using a pair of Look ones), plus my trusty Bell helmet, courtesy of Danisco. I flew from Heathrow with Jet Airlines and by pure coincidence remembered they had a 25kg luggage allowance, which was just as well as I needed it. Tramping round a huge trade fair for three days plus eating copious amounts of delicious Thai cuisine was hardly an ideal tapering programme, plus the 20 degree increase in air temperature added to the challenge. Anyway, we duly arrived in Royan and checked in to our hotel which was literally overlooking transition. The event cost the princely sum of £8 and that included a nice t shirt, but not a swim cap. On face value it was the cheapest race I'd ever competed in, but after factoring in my race insurance it was not so cheap, but you can't put a price tag on triathlon racing. I had thought about doing the standard distance event but given my relative lack of fitness and the ambient temperature I opted to race the Sprint, which it turned out was a wise decision as the mercury was reading 28°C when I finished. 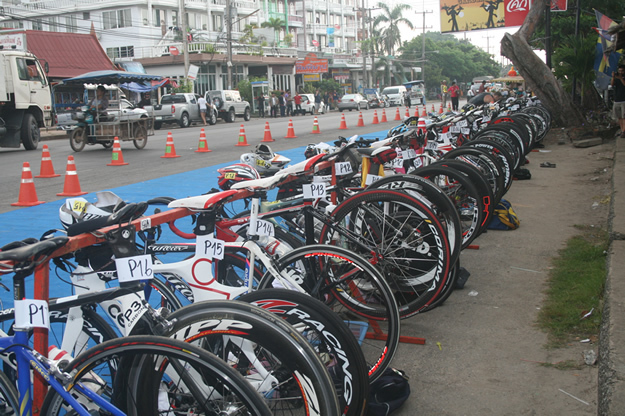 Race day dawned and breakfast was bread and jam as muesli is a bit hard to find in rural Thailand. There were around 160 competitors, which included a good number of juniors which was great to see, plus quite a few ex-pats had flown over from Hong Kong to race, which pushed up the numbers. The swim split was typically U-shaped and around 7am, after the usual cheers and psyching up, we were off! The bike split was a 20km affair, far too flat for my liking but far enough as my anatomy reminded me that riding on a borrowed saddle is not ideal. That I was not my usual “lanterne rouge”.. It was then a case of packing up and checking out of our adjacent hotel. Lunchtime was approaching by now and Chakrit found us a very nice restaurant where we sampled some of the excellent local seafood dishes. 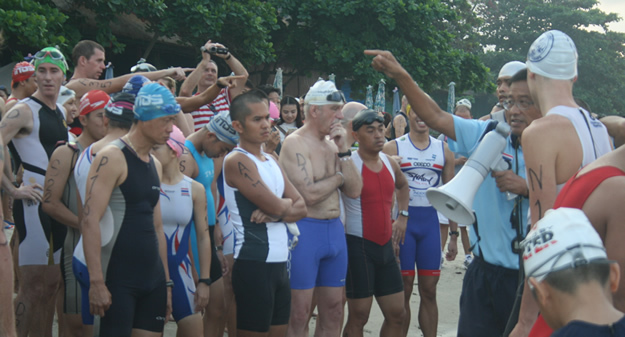 My thanks go to the race organisers, Vijitr Sitinawin of the Thai Triathlon Association and all the unsung heroes that made racing an enjoyable activity. Furthermore, I was delighted to be asked to race again next year. 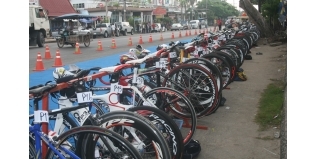 Fast forward and its April 10th and the first Barracuda training duathlon. I finished at 8pm and I was frozen – Thailand but a distant memory.We had a turn out of 37 members, by far the best for ages. I was last on the run - hardly surprising - but had four guys behind me on the bike split so that was some compensation. Life in the old dog yet! On a brighter note. Let's hope the weather picks up soon and all involved in our great sport will have an enjoyable, fulfilling, and above all, accident–free season's racing.